It seems that some people are just destined to meet. 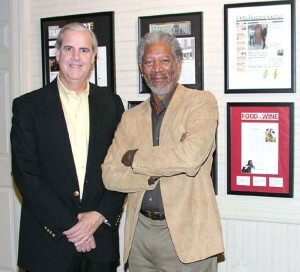 Take actor Morgan Freeman and businessman and attorney Bill Luckett. Since they met in the mid-1990s, they’ve partnered in a blues club, an upscale restaurant and a couple of different aircraft. If they were different genders, you’d say theirs was a “marriage” made in Heaven. 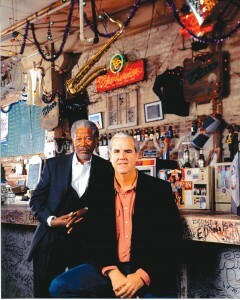 Bill Luckett and Morgan Freeman are partners in Ground Zero Blues Club and Madidi, an upscale restaurant. Although all those partnerships now seem so logical and natural, not all of them were instantly apparent. They both loved blues music and good food, but when they met, Luckett had been flying for over two decades and Freeman was enamored with sailing. Bill Luckett has lived in Mississippi all of his life, except for about six weeks. Although he also has a house and law office in Memphis, he’s lived in Clarksdale for all of that time except about six months. “He got moved around and ended up on submarines,” Luckett said. The fact that his father was a pilot didn’t influence his decision to later fly. Bill Luckett graduated from Clarksdale High School in 1966, and attended the University of Virginia. Later, he attended Ole Miss Law School (the University of Mississippi School of Law). After graduating in 1973, he joined his father’s law firm. “There were a number of Lucketts here practicing law at that time—father, wife, uncle down the street,” he said. He developed an interest in wanting to learn to fly while chartering planes at Clarksdale Fletcher (CKM), to fly to Jackson, Miss., on business. “I realized I could convert what was a full day driving—doing my business, round-trip travel—into a half-day, by flying,” he said. Luckett got the opportunity to learn to fly right after he started practicing law. Luckett soon began taking lessons with Carl Graves, who was a supervisor working for air traffic control in Memphis at the time. “I was the only one of us three who finished the program, so to speak, and got my private,” he said. When he initially thought of the value of flying, he couldn’t help thinking that it just didn’t look that difficult. Luckett, who has about 2,700 hours and now serves on the Clarksdale-Coahoma County Airport Board, said that as soon as he got his private license, his law firm bought a Piper Cherokee 6-300 from his father-in-law. Luckett would eventually have a partner in that Piper Seneca II, a light twin-engine six-passenger aircraft. Morgan Freeman would also invest in a 414 Cessna with Luckett. After Freeman got involved with the Seneca, a few years ago, the aircraft saw more work. “We’ve repainted and reupholstered it,” Luckett said. Luckett and Freeman became friends after Myrna Colley-Lee, Freeman’s wife, asked the attorney for some legal advice in the mid-1990s. Although he was born in Memphis, Tenn., in 1937, and although his stepfather and mother lived temporarily in Chicago, and in Bruce, Miss., Freeman lived most of his youth near Charleston, Miss., a small town about 40 miles southeast of Clarksdale. “Morgan got the longest standing ovation ever offered anyone in the Mississippi House of Representatives, and it was 100 percent attendance,” Luckett said. “He was presented with a resolution honoring him and citing his many accomplishments and basically thanking him for making Mississippi his home. The whole house stood up at least three or four times in what was really about a 10-minute presentation, and they clapped for eight minutes after that. It was a tribute of the highest proportions. He was commended for his wide body of work in film, but also for his local philanthropic efforts since moving back to Mississippi in the early 1990s. In the resolution, they acknowledged Freeman’s awards including a Tony Award, the Clarence Derwent Award, Drama Desk Award, Obie Award and the Dramalogue Award. Since 1966, Freeman has been seen in more than 50 films, including the one which really launched his career, “Street Smart” (1987). He’s been busy since then, appearing in films including “Clean and Sober” (1988), “Lean on Me” (1989), “Driving Miss Daisy” (1989), “Glory” (1989), “Unforgiven” (1992), “The Shawshank Redemption” (1994), “Se7en” (1995), “Kiss the Girls” (1997), “Hard Rain” (1998), “Deep Impact” (1998), “Under Suspicion” (2000), “Nurse Betty” (2000), “Along Came a Spider” (2001), “High Crimes” (2002), “The Sum of All Fears” (2002), “Bruce Almighty” (2003) and “The Big Bounce” (2004). He’ll be seen in at least 10 more movies in the near future, which have either recently finished production, are still in production, or have already been announced. He won the Los Angeles, New York and National Society of Film Critics Awards for best supporting actor and was nominated for an Academy Award and Golden Globe Award for his performance in “Street Smart.” He won his second Academy Award nomination, the Golden Globe Award and The Silver Bear for best actor at the Berlin Film Festival for “Driving Miss Daisy” (he played his same role, that of chauffeur Hoke Colburn, in the stage version). He was nominated for an Academy Award for the third time for “The Shawshank Redemption.” In 1993, he made his film directorial debut with “Bopha!” starring Danny Glover and Alfre Woodard. Soon after that, he formed Revelations Entertainment, a production company. Although Freeman couldn’t wait to leave home, he later often visited his parents. Then, when his father died, he returned to look after the family farm. He was surprised to eventually discover that coming home, getting away from “the crush,” felt good. 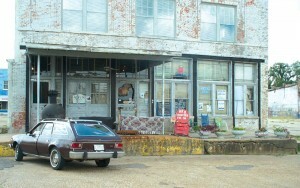 Madidi officially opened in Clarksdale in January 2001. His return to Mississippi would also remind him of another childhood fascination. Besides westerns, war movies had also captivated him. “I watched anything that had aircraft in it—flying from the ground, from off of a ship,” he said. That passion didn’t carry over to endless hours building models, however, as it did for many other children. “I wasn’t too good with model aircraft. I did build one, and it was fine, but I couldn’t gunk it, so I just stepped on it!” he said. Freeman said he joined the Air Force when he was 18, in hopes of becoming a jet pilot. After his honorable discharge in San Bernardino, one acting job led to another, and he ended up in New York. Although it would be decades before he would actually fly, Freeman later discovered a love for sailing. He ponders a similarity between himself and singer Jimmy Buffett, another well-known sailor/pilot. When Luckett first met Freeman, the actor was splitting his time between his co-op apartment in Manhattan and his boat in the Caribbean. Luckett, who has spent time on Freeman’s boat, praises his abilities—and the boat. Luckett explains that a lot of the concepts of sailing and flying are the same. With that in mind, once the two became friends, it wasn’t difficult for Freeman to take up flying. He says that his longing to fly “on this last incarnation” was due to Luckett. Dining out meant Memphis or possibly Oxford—that is, until 2000, when Luckett and Freeman decided to open their own fine dining establishment in Clarksdale. The idea was appealing to Luckett for another reason; he had always had an interest in architecture, construction and design. It began in the ninth grade, when he started painting houses. Later, during college holidays and summers, he continued painting. Then, between college and law school, joining the military would give him more practice. He joined the Army Reserve and later the National Guard, and had a year of active duty. While in law school, he went to Officer Candidate School, and became a second lieutenant; he ultimately was the commander of an engineering construction unit, which did several large construction projects. While in law school, he also continued painting. After dabbling in renovation, in 1992, he completed his first house. He’s renovated five old buildings in downtown Clarksdale. “Sometimes they’ve been empty as long as 50 years before I converted them,” he said. “Usually, it was just four walls left standing, with a falling-in roof. I like the challenge. He remodeled the three-story Hotel Clarksdale, turning it into eight apartment units. And he owns a 101-unit apartment complex in Clarksdale. 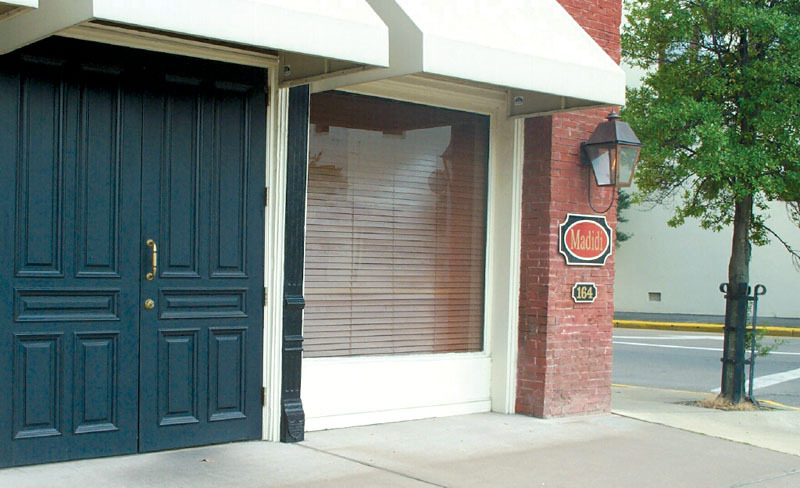 All that remodeling meant that Luckett felt comfortable renovating an early-twentieth-century redbrick building in Clarksdale into an upscale restaurant, with Freeman as his partner. Madidi, named after a national park in Bolivia, had a soft opening in November 2000, but officially opened in January 2001, with David Krog (formerly of La Tourelle in Memphis) as the chef de cuisine. The atmosphere of Madidi reflects the tastes of Francine Luckett and Myrna Colley-Lee, who is a film set and costume designer and helped with the interior design. Works from local artists grace the interior walls. A comfortable bar and main dining area is located on the first floor, with private dining rooms on the second floor. Luckett explains that when the couples first began spending time together, they also “tried” to get out to enjoy blues music, but that wasn’t easy to do either. “Believe it or not, at that time you couldn’t get reliable or consistent blues music even in Clarksdale on weekends, even though we’re ‘ground zero’ for blues music. This is where the blues music started,” he said. That changed with the creation of Ground Zero Blues Club, a “juke joint” that opened in May 2001, about two blocks away from Madidi. “We named our club after what we had always referred to the area generally as,” he said. “They either start in New Orleans and go north, and then come to Clarksdale and Memphis, and then Nashville or St. Louis, Detroit, Chicago, or they start north and come south,” he said. Ground Zero Blues Club is at Highway 61, which Luckett said Bob Dylan and other musicians have sung about in their music. Located at Blues Alley, next door to the Delta Blue’s Museum, GZBC features performances by both local and national blues bands, offering a “true Delta Blues experience at its very best.” Luckett and Freeman partnered with Howard Stovall, the former executive director of the Blues Foundation, on GZBC. Madidi and GZBC have been featured on CNN, Turner South, The Travel Channel and The Discovery Channel, and in Gourmet, Bon Appetit, Food and Wine, Southern Living, Delta magazine, National Geographic Traveler, Flying Adventures, New York magazine and USA Today. With all the publicity, Luckett admits they still financially have to support both ventures. He adds that Ground Zero is going to be expanding. Luckett has also built apartments above Ground Zero Blues Club. Both men spend as much time as possible at GZBC and Madidi. In mid-September, Freeman returned to Mississippi after spending time in France. He had about a day to rest up before heading to Memphis with Luckett for a rock & roll gala black tie event at the FedExForum. Following that, they headed to Chez Philippe. Luckett remembers the night Freeman decided to take the plunge. The next day, Luckett drove out to where his Seneca II was hangared at Clarksdale Fletcher Field. Luckett grins and says the experience reminds him of a trial he once attended. “A long time ago, I was at a trial that involved a lawsuit by a pecan orchard owner against an ag pilot—we used to call them crop dusters,” he said. “The lawyer for the pecan orchard was complaining that his client had lost his pecan crop because the cotton duster/pilot had defoliated his pecan trees in addition to defoliating the cotton crop—you drop a chemical to knock all the leaves off, so you get to the bowls of cotton. Freeman said he was “game” and willing to “just go for anything.” He’s thankful that Luckett trusted him. Luckett said it was good training for him to take over at the last second, get the aircraft corrected and back on track, and land. “But after a while, he got very proficient,” Luckett said. He said they continued their routine through about eight flights, up until June 2002. Then, Luckett told Freeman that their “lessons” had to end, since he wasn’t really an instructor. “I told him, ‘You have this down now. Now you need to do this with somebody where you can get real credit,'” Luckett recalled. That someone would be an independent flight instructor named Jimmy Hobson, who happened to taxi up with a student, as Luckett and Freeman stood talking that day. 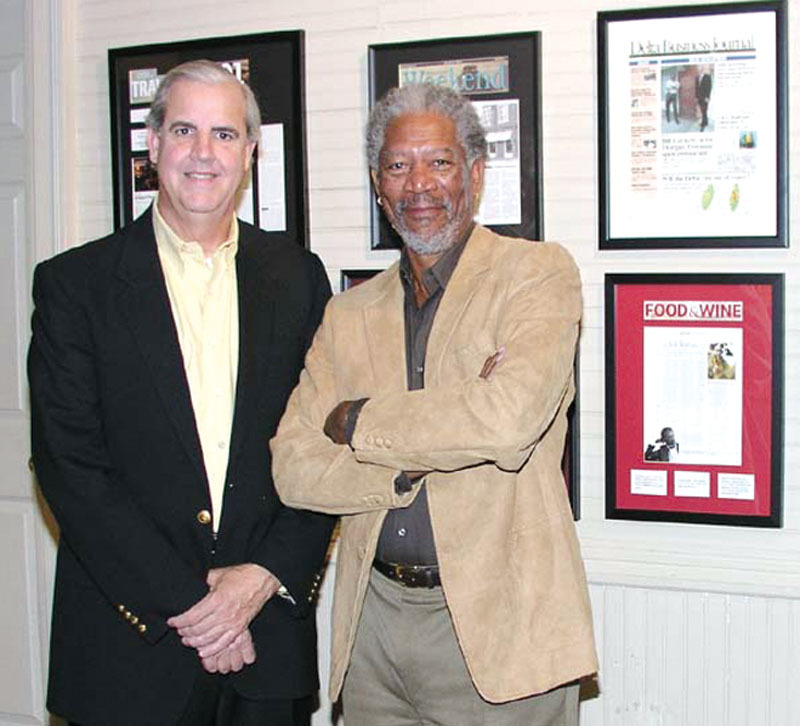 After getting his private in October 2002, Freeman kept taking lessons with Hobson, a CFII out of Helena, Ark., who comes to Clarksdale frequently. Freeman says he flies to as many film locations as he can. “Every opportunity I get, I fly myself,” he said. 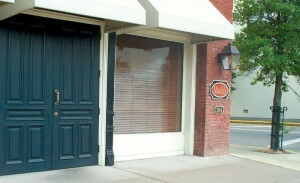 Ground Zero Blues Club is located at Blues Alley, next door to the Delta Blue’s Museum. Freeman says that particularly every flight he makes is “memorable,” but one flight really stands out in his mind. On that flight, on which Luckett wasn’t present, thunderstorm activity facing him meant an alternate landing in South Dakota. One evening in June 2003, Freeman was returning to Mississippi from Kamloops, British Columbia, where he’d been filming “An Unfinished Life,” which also stars Robert Redford and Jennifer Lopez. Because of the weather, he changed flight plans and landed at Wagner, S.D., instead of his scheduled refueling stop in O’Neill, Neb. “It was dark, so we just decided to go to the nearest available airport and land,” he said. Wagner Municipal Airport Manager John Otte was incredulous when Freeman stepped out of the plane, but disappointed to be without a camera. Freeman, knowing he’d be spending the evening in town, graciously offered to pose for a picture the next day, while he refueled. He also caused a stir at the local Super 8 Motel, where he spent the night. The town’s people won’t forget that visit, and neither will Freeman. Another interesting flight, which is also the farthest distance Freeman has flown, was with Luckett to Virgin Gorda, in the British Virgin Islands last November. Freeman flew about 80 percent of that total trip, with Luckett flying a few legs to give him a rest. “Bill was selflessly trying to help me build up hours,” Freeman explained. Luckett happened to be flying the Seneca during the most harrowing leg of the trip. He says he was lucky to have Freeman in the right seat for that particular leg of their adventure. “He was working the Garmin 530 and I was trying to keep the airplane in the air,” he said. During that flight, the men made multiple stops. “We stopped at Daytona to visit his wife’s dad, and then we flew down to Fort Pierce, Georgetown Exuma, Providenciales and the Turks and Caicos (Islands),” Luckett said. Although they were just going to make a fuel stop in Providenciales, they were weathered in there. “There was a big tropical storm over Puerto Rico and the Virgin Islands so we stayed a couple of days waiting it out,” he said. Once back in the air, they headed toward Beef Island Airport, near Road Town, Tortola. They were communicating with San Juan Center and had been assigned an altitude of 5,000 feet to go directly to Road Town, but as they started getting closer, the weather began deteriorating. “I was trying to call back to center to divert to St. Thomas or somewhere else, but we couldn’t raise anybody on the radio,” Luckett said. “There we were flying into weather, and on an IFR flight, unable to talk to anybody. I called the tower at Road Town and got them to get on a land line and contact San Juan. They did, and came back and gave us an alternate frequency. We were able to make contact to get clearance to land, but then our problems were still compounded because we had bought approach plates in Florida for the whole Caribbean and this particular airport’s approach plate wasn’t in the booklet. Unable to see anything, they finally were able to get down legally low enough to break out. “But we were in awful rain and made a couple of real tight turns,” he said. “Morgan was a great help on that landing. He was counting down miles and helping me count down the altitude. We were in some pretty rough weather. We were able to land it, but flights right after us were unable to get in. It was raining so hard we couldn’t even get out of the plane without getting totally drenched. We weren’t in a thunderstorm, fortunately, but we were in zero visibility down to minimum descent altitude, at an unfamiliar airport, with mountains around, without the approach plate. That’s a little hairy. Coming back, the men made three or four stops. “Going down, because we were going IFR, I think we were flying at 9,000 and 11,000, and 10,000 to 12,000 coming back,” Luckett said. Nowadays, with the 414, Luckett said they go up to altitude and get in the 20,000s. “We’ve both been up to flight level 230 in the 414,” he said. Freeman also owns a Piper Arrow, but has plans to sell it. For the last several years, he’s also had a fractional share in a Beechjet 400A and a Hawker 800XP with Flight Options. “A guy who’s known as Poe, who was an air traffic controller there and who lives in Clarksdale now, set it up for us,” Luckett said. Columbus Air Force Base is home to the 14th Flying Training Wing of Air Education and Training Command’s 19th Air Force. The wing’s mission is specialized undergraduate pilot training in T-37 “Tweet,” T-38C “Talon” and T-1A “Jayhawk” jet trainers. “After the training, we went up for an hour,” Luckett said. “I had a captain and Morgan had a captain. It’s a side-by-side cockpit arrangement. They were in the left seat, the pilot-in-command’s seat. We had a ball. Of course, those guys are real jockeys; they know their stuff. “We took off at Columbus, in formation, with Morgan and Captain Lee Glenn in the front, and Captain John Speer and me in the back. We’re getting up to the MOA (Military Operations Area), which is 8,000 and above. We sort of trailed each other, and then climbed down in tandem. Once we got into the MOA, we resumed a tighter formation. After about 30 minutes, Luckett and Speer took the lead. “We’re up at 13,000, 15,000 feet, with solid white underneath, because there’s a solid cloud layer below us,” Luckett said. “There’s blue sky above. We get wingtip staggered to wingtip and all of a sudden that guy just kind of nudged his hand. Cockpit to cockpit, 300 knots at 13,000 feet, these guys are looking at each other, just like we’re going down the interstate, looking across at the other car. They just kind of wink or blink; they already know what they’re getting ready to do. They put you through it—straight up, straight down, sidewise, looping—all kinds of fun stuff. Luckett said they were told that 90 percent of new pilots and passengers get sick, but they didn’t. “We both resisted getting sick,” he said. “I guess I have a strong stomach because I’ve been flying a long time, and Morgan’s been a sailor a long time and a pilot as well. Freeman and Luckett have agreed to participate in a round-the-world flight being organized by Alex Major and the King Air Foundation, a Mississippi nonprofit corporation. Since 1985, Major’s company has owned King Air LJ-1, which Olive Ann Beech, the wife of Beech Aircraft Company founder Walter Beech, used as her personal corporate transport. In 1990, he brought in a partner, Dr. Fred Pasternack, to assist in funding the continued preservation of this piece of aviation history. A restoration process has begun that will culminate in an historic flight. Following that flight, King Air LJ-1 will be donated to an unspecified museum. Luckett said they accepted Major’s offer to fly a leg of the trip on condition that the King Air is made airworthy. At the present time, Major is also recruiting people to help in the rebuilding process. Although Freeman and Luckett do a lot together, there are some areas where they agree to disagree. For instance, Luckett loves to fish. “Morgan doesn’t go fishing with me,” he said. He said there was one exception, but the cameras were rolling. “We did do a segment for Turner South’s ‘Off the Menu’ where we were crappy fishing,” he said. Freeman also doesn’t share Luckett’s love of motorcycles. Master Sgt. 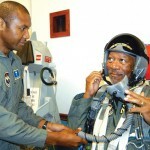 Curtis Chiles conducts egress training for actor Morgan Freeman before his orientation flight in a T-37 Tweet Aug. 12. Freeman also ate lunch with about 50 airmen from the base. Chiles is assigned to the 14th Medical Operations Squadron. 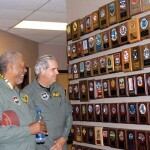 Morgan Freeman and Bill Luckett admiring student class patches in the Operations Group Building. Each class of student pilots creates a patch that they wear during their year of specialized undergraduate pilot training at Columbus AFB. 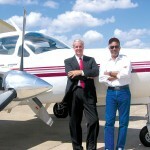 Bill Luckett and Morgan Freeman co-own this Cessna 414 as well as a Piper Seneca II. 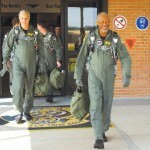 Bill Luckett and Morgan Freeman stepping out to prepare for their T-37 Tweet orientation flights. For more information on Madidi and Ground Zero Blues Cub, visit [http://www.madidires.com] and [http://www.groundzerobluesclub.com].